For other uses, see Manhattan Project (disambiguation). After being given superpowers, Harry S. Truman (a.k.a The Truman Torch) personally drops the bomb on Hiroshima. The Manhattan Project, or more formally the Manhattan Engineering District, was an effort by the United States, with assistance from the United Kingdom and Canada, during World War II, to develop the capability to endow normal humans with superpowers — specifically the project aimed to grant these superpowers to the American President. 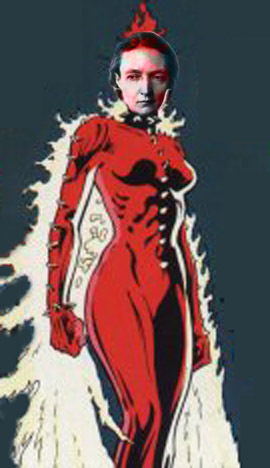 The research was directed by American physicist J. Robert Oppenheimer, and was begun after the nascent Central Intelligence Agency reported that the creation of superpowers was a technical possibility and that Nazi Germany was already pursuing this technology in order to create their own Übermensch. The project was deemed to be of the utmost importance, therefore secrecy had to be maintained at all costs; in addition to the project's veiled name, a cover story was put out that the Manhattan Project was actually developing a nuclear weapon. This disguise was so well implemented that as part of the cover story, a nuclear weapon was actually developed. More importantly, however, the project succeeded in allowing scientists to imbue the President of the United States with superpowers. Both of these inventions were implemented when President Harry S. Truman personally flew across the Pacific carrying a uranium-based nuclear bomb, which he dropped on the city of Hiroshima, Japan. 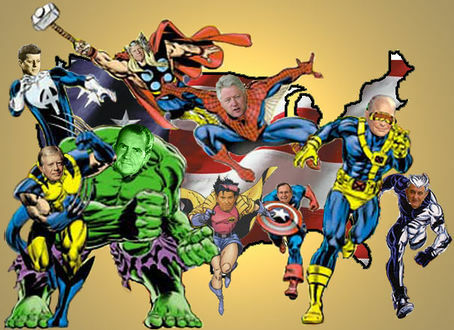 The idea of a President with superpowers originated in the early days of the Republic with the American Justice Coalition, an elite group of super-powered Americans who individually were prominent Founders and early statesmen, but collectively were a team of superheroes who defended the United States against its enemies, winning the War of 1812, preventing a meteor from destroying Earth, and discovering Oscar Wilde. Among the members of the American Justice Coalition were the first four Presidents of America: George Washington, John Adams, Thomas Jefferson and James Madison. For a time it was unthinkable that an American President could be a mere mortal, but only a single generation after Independence all of the original members of the American Justice Coalition were either dead or had already served. Unfortunately, no new superheroes had arisen to take their place. As Madison's second term began its final year in 1816, the nation faced the possibility that it might have to elect a normal President. Only half-alien, John Quincy Adams had fewer superpowers. This disaster was averted temporarily when Madison's protege James Monroe announced his bid for the Presidency wearing what appeared to be Madison's green alien ring, from which Madison derived his superpowers. Though Monroe successfully served two terms, modern historians believe it was a ruse. Madison kept the original ring, they suspect, but used its power to create a second replica ring, the one which Monroe then wore. Following Monroe, the nation turned to John Quincy Adams, the son of former President and Justice Coalition member John Adams. The elder Adams, a green shape-shifter, had derived his powers from the fact that he was in fact an alien being, possibly from Mars. The new President, John Quincy Adams was only half-alien, born to the human Abigail Adams, and while he did possess some superpowers, his election heralded that the era of the super-President was coming to a close. Not that kind of fairy. With all the brightly-colored superhuman candidates used up, Americans turned to what they though was the next best thing: the war hero, which at least had the word hero in its name. Between the years of 1828 and 1848, three of the five Presidents elected were former war heroes. The strategy was ill-fated, however, as these men tended to be elderly and frail, so that two of the three died in office. Following these mistakes, Americans elected President James Buchanan on the theory that he was a "fairy." Unfortunately he was not the magical kind of fairy, and instead of leading America to a pot of gold, he lead it to the brink of Civil War. Surely the halcyon days of the mythic American President were over. 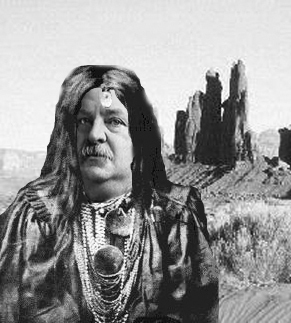 Grover Cleveland undertakes a vision-quest to rid himself of an Indian Curse caused by a failed attept to grant him superpowers. 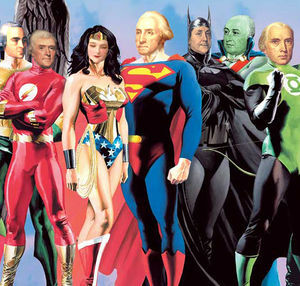 Near the end of the 19th century, the Federal Government explored the idea of using modern advances to restore the institution of the superhero president. In 1886, explorers discovered a magical artifact in the Indian Territories of the American Southwest, which they gave to President Grover Cleveland with the intention of giving him superhuman abilities. Unfortunately, the artifact was cursed, causing Cleveland to lose the election of 1888. After performing a vision-quest, Cleveland rid himself of the curse and retook the White House in 1892, but the incident stalled the quest for endowing elected presidents with superpowers until Cleveland's successor, William McKinley, was elected in 1896. 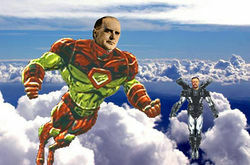 President McKinley and Teddy Roosevelt flying in their iron suits. President McKinley turned to a technological solution, convincing the American Steel industry to develop special armored flying suits for himself and his Vice President, Teddy Roosevelt. The iron suit, however, was bulky and uncomfortable so it could not be worn all the time. This weakness allowed McKinley to be assassinated by the supervillain Mandarin, who fought McKinley over his association with the railroad industry and its exploitation of Chinese laborers. When Roosevelt assumed power, it was with more caution about the iron suit, and following his efforts to break the American industrial trusts, the Steel Industry withdrew its support for the superhero program. After two failures, the government gave up on the superhero initiative until another Roosevelt felt the need to begin the Manhattan Project nearly four decades later. Marie Curie's daughter developed telekinetic abilities due to radiation exposure in utero. In the early twentieth century, scientists began to unlock the secrets of the atom. Following the discovery of the electron and radioactivity, it was learned that the atom was not indivisible. To the contrary, it had a creamy center, one which promised the ability to bend all the previous rules of science. Scientists first suspected that radiation might hold the ability to grant super-powers when Irène Joliot-Curie, who had been exposed to radiation while in the womb of her mother Marie Curie, developed telekinetic abilities. In the 1930s, German and Hungarian scientists published papers in the prestigious scientific journal Action Comics suggesting that radiation had potential uses in creating a superhuman. Meanwhile, the political arena saw Adolf Hitler rise to power in Germany on an anti-Semitic platform. When Hilter began his racial purity programs, many feared that it might be in anticipation of creating an entire population suited to being given superpowers. When Germany invaded Poland in 1939, World War II began and many in the scientific community feared what might happen if Germany became the first nation to produce a new superhero. Amid this concern, President Franklin D. Roosevelt authorized the launching of the Manhattan Project to create American superhero technology. The Project began in earnest when military General Grove, who named the initiative, was appointed to command the project. He appointed Oppenheimer lead scientist, and, together with American scientists and many European Jewish refugees, they began work. The first step was to isolate various radioactive patterns and determine their properties. Within the first year, the researchers had successfully developed types of radiation that when directed toward objects could make them levitate, become invisible, resist external force and turn green. The trick was to find out how to make these radiation patterns stable and persistent in a human. Scientists attempt to imbue the ability of flight on a laboratory mouse. By early 1945, they had achieved success on laboratory animals, giving a mouse the power of flight. A coded phone call brought news of the successful test to Washington, saying, "The Italian navigator has landed in the New World, and this time he didn't wipe out the natives with pestilence." In April of that year, President Roosevelt ordered that he be given the experimental procedure in order to found a New American Justice Coalition in America's greatest time of need. Unfortunately, the treatment was too strenuous on Roosevelt's already frail body, and he died a few days later as a result. Harry S Truman first learned of the Manhattan Project when he assumed the presidency following Roosevelt's death. As a Vice President, Truman had been kept away from vital intelligence information and as President he was immediately confronted by the knowledge that the United States had developed superhero technology, and that in trying to cover up this fact it had also developed an atomic bomb. The war in the Pacific Theater continued to rage and Truman made the bold decision to employ both advances in an effort to save countless lives by taking action that would definitively end the war. 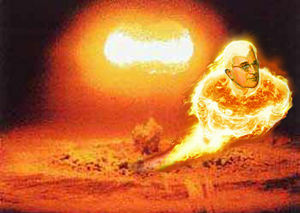 Truman underwent the Manhattan Project's procedure, gaining the ability to fly and to spontaneously burst into flames without burning himself. Using this power, Truman personally dropped two atomic bombs on the Japanese cities of Hiroshima and Nagasaki. The move ended the war and begun the new era of the American superhero President. 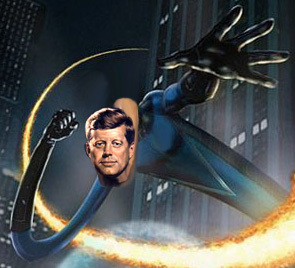 JFK challenged America to put a man on the moon to find out if that would yield an even greater superpower. 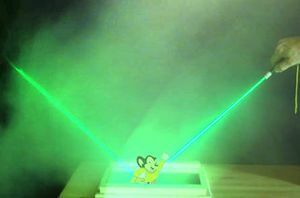 Following after Truman, President Dwight D. Eisenhower also underwent a procedure developed by the Manhattan Project, giving him the ability to shoot laser beams from his eyes. The next President, John F. Kennedy, was the only elected President in recent history not to undergo a the Manhattan Project's treatment. Instead, he was launched into low Earth orbit in a Mercury Program space capsule by NASA so that he could be exposed to cosmic radiation — a process which gave him the ability to stretch any part of his body to extreme widths and lengths. Lyndon B. Johnson resumed the tradition of using the Manhattan Project's work, gaining the ability to run and react very very fast. In 1970, the Project decided to use its lesser known gamma ray research and transformed mild-mannered Richard Nixon into a gigantic, angry, green, maniacal "Hulk." 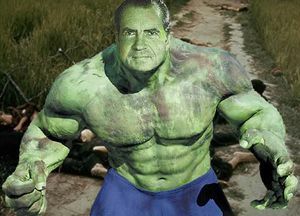 In time Nixon learned to control his anger, becoming the "Hulk" only when needed. Nevertheless, the gamma ray research has not been used again. "NIXON SMASH!!!" Like Kennedy, Gerald Ford, who became President after Nixon's resignation, did not take the Manhattan Project's formula. This, however, was only because when the Russians attacked during his term, Ford discovered that he was actually the Norse deity Thor, who had been cast out of Asgard and had his memory altered as a punishment from his father Odin. Using his newfound godly powers, Ford beat back the Russians and was accepted as a superhero President even without the formula. We're going to mutually limit the manufacture of strategic nuclear arms. Wanna make somethin' of it, bub? 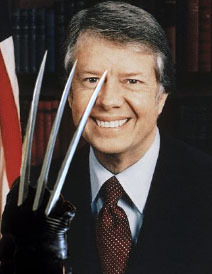 Jimmy Carter was not only given superhuman healing abilities, he was also implanted with an adamantium skeleton, complete with retractable razor-sharp claws. A peaceable man by nature, he used them only once, when he ended the Iranian Hostage Crisis by storming the embassy himself in Operation Eagle Claw. Although he never used the weapons again, he found in his later diplomatic career that a quiet word and a razor-sharp claw gets you much more than a quiet word on its own. Ronald Reagan was given the ability to shoot "fireworks" from his hands: energy globules that obeyed his mental control and which could make anything from pretty lights and sparkles capable of blinding someone to powerful energy detonations. Some fear that George W. Bush may use his powers for evil. George H. W. Bush was given superhuman speed, strength and agility, and he was given a unique, unbreakable shield with the colors of the flag on them. He likes flags. For Bill Clinton, the Manhattan Project used its technology to create a special radioactive spider, which then bit Clinton, giving him all the powers of a spider, including proportionate strength, a sixth sense, and the ability to climb walls. He was famed for his saying, "With great power comes mucho booty." George W. Bush was given power over the force of magnetism. While he has occasionally worked for good, some suspect that he may be the first supervillain created by the Manhattan Project. Ever since President Truman left office, the current President and all living ex-Presidents have nominally been part of the New American Justice Coalition, which was formed to replace the original AJC that existed at the time of the founding. Though the coalition often exists only loosely, they can be drawn together in times of great crisis. The last time they gathered together, they worked to fight the Indian Ocean Tsunami and the Gulf Coast Hurricanes. The New American Justice Coalition. This page was originally sporked from Wikipedia — well sort of.